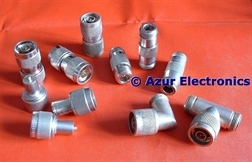 A variety of adaptors are required to connect different types of connectors together and to convert from female to male (socket to plug), etc. 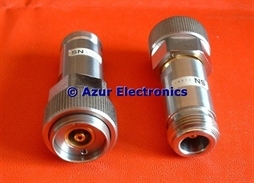 Although there are many types of connectors, I have standardised on the N-type and the BNC for my workshop use. Other types used in my test equipment are APC-7, SMA, SMB and SMC. N-type 50Ω Adaptors and 3 50Ω Terminations (2 of which are used with the HP 8411A). Generally good for DC to 18GHz. N-type to BNC 50Ω Adaptors. 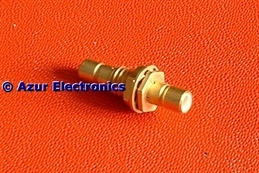 N-type female to SMA female 50Ω Adaptor. 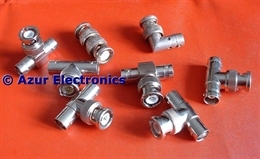 The N-type coaxial connector has a threaded coupling. Radiall specify its performance from DC to 11GHz at 50Ω. Radiall series R161/R191 are 50Ω versions. There is also a (non-standard for me) 75Ω version that has a smaller centre pin in the plug and a smaller receptacle in the socket. These are not inter-mateable with the 50Ω version. Radiall series R162/R192 series are 75Ω versions. 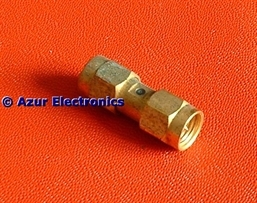 BNC 50Ω Adaptors, generally good for DC to 4GHz. 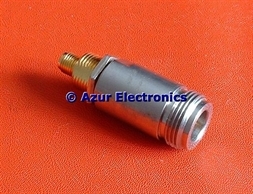 BNC 50Ω male to 4mm female Adaptors, used with multimeters and power supplies, etc. 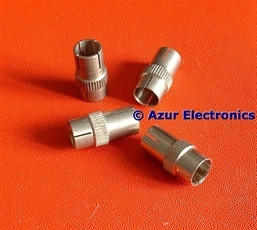 These 4 Adaptors are used to connect an Oscilloscope or Multimeter Probe to a BNC female. SMA 50Ω male to male Adaptor. Generally good for DC to 18GHz. SMB 50Ω female to female Adaptor. 7 off SMA male to BNC female 50Ω Adaptor Cables. 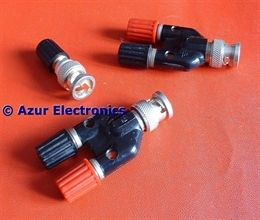 2 off SMB female to BNC female 50Ω Adaptor Cables. 5 off SMA male to possibly SMB female 75Ω Adaptor cables. I am really not sure about these and do not have anything that mates with them so I will put them on my For Sale page in case they are of use to anyone else. 3 off SMA male to male rigid 50Ω coax cables from a scrapped unit. 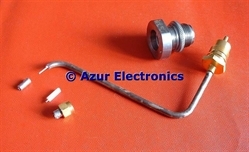 A N-type female 50Ω bulkhead socket with rigid coax to a cut-off end for a SMA male. This is useful for probing circuits that need a test connection to a 50Ω input/output. APC-7 to N-type female. These are used with the HP 8411A Harmonic Frequency Converter. 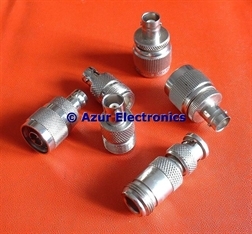 APC-7 are hermaphrodite connectors and can be tricky to mate, see http://na.support.keysight.com/pna/connectorcare/APC7.html for information. All of these adaptors and accessories are 50Ω impedance. It is very important to impedance match source and load for maximum power transfer, and to minimise reflections and distortion. Test equipment can not be daisy-chained together, if you need several instruments to be connected together then power dividers must be used for correct impedance matching. For instance a signal generator feeding the input of the DUT (Device Under Test) will be correctly matched. The output of the DUT feeding a frequency counter and a power meter will require a power divider. Power dividers (or power splitters) usually introduce a 6dB loss into each path. 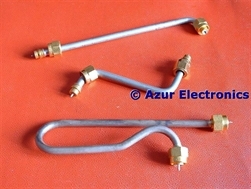 Not all of these adaptors and accessories will operate over the frequency range of dc to 18GHz. Therefore it is important to qualify the bandwidth and insertion loss before making measurements. The Spectrum Analyser and Tracking Generator can be used for this. So far, I seem to have just enough adaptors and accessories for the work I am doing, although I am on the lookout for more. I also have various adaptors and accessories for F-type (used on TV Satellite equipment).